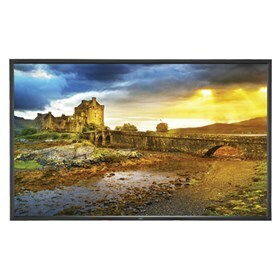 The NEC V323-DRD is a 65" LED-backlit ultra high definition professional grade large screen display. The display sets new standards in image size and quality with UHD (3840 x2160) resolution. It is future-proofed with OPS expansion slot and is suitable for 24/7 operation. This monitor have 178° horizontal and vertical viewing angles and brightness of 320cd/m2 with 1,300:1 contrast ratio. The V323-DRD features Spectraview Engine that enhances image performance with advanced settings of all relevant visual parameters for full control of brightness, color, gamma and uniformity. The NEC X651UHD has many exciting features for users of all types. See the NEC X651UHD gallery images above for more product views. The NEC X651UHD is sold as a Brand New Unopened Item.